If you want to get June off to a winning start with some exciting new slot, then read about three of the best new releases below. Tales of medieval queens continue to enchant us to this day and now NextGen Gaming has brought these stories to life on the reels in a feature packed new slot called Queen of the Castle. 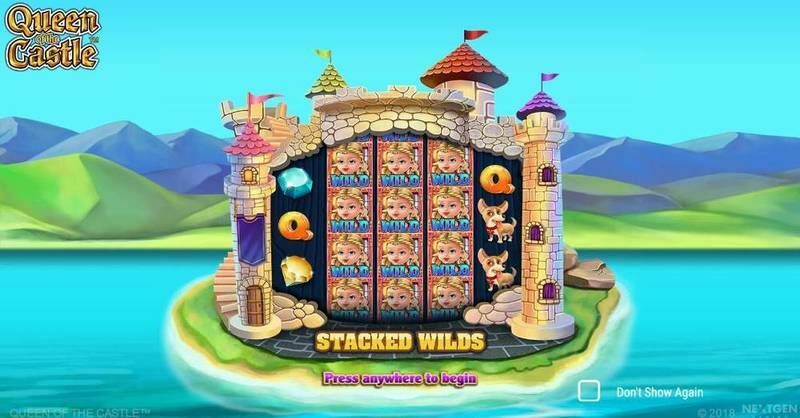 Queen of the Castle is a 5 reel slot, with each reel having three or four rows to create a total of 576 ways to win. The reels are embedded in the walls of the queen’s castle, which is surrounded by a moat with green rolling hills stretching away in the background. The high value symbols are theme related and include the game’s logo, a dog, a purse and money, a throne, and four different gems. The lower value symbols are the playing cards J through to A. The wild symbol is the queen, she will substitute for all the other symbols, except the bonus and scatter symbols, to help and form winning combinations. The scatter symbol is a golden shield. Before any spin vines can grow and wrap themselves around the middle three reels. This locks the reels together and results in them showing the same symbols in adjacent positions after a spin. Hopefully this will then result in a number of wins. The free spins are triggered by landing at least three bonus symbols on the reels. You are awarded fourteen free spins during which a crown symbol replaces the bonus symbol on the middle three reels. Each time the crown lands it fills up the Tower Meter a bit and this helps you advance through four levels of upgrades. At the first level the number of positions on the middle three reels increases to create 1,125 ways to win and you receive two extra spins. At the second level the reels increase again to make 1,944 ways to win and you receive two extra spins. At the third level the reels increase once again to create 3,087 ways to win and you are awarded two extra spins. At the fourth level you will receive up to six extra free spins. There are also red and purple mystery chest symbols that can land stacked on the first and fifth reels respectively. If the red chest lands stacked on the first reel all of the playing card symbols are removed from the reels and replaced by red chests. After the next spin the chests are transformed into matching symbols to help form a win. If the purple chest lands stacked on the fifth reel then all of the gem symbols and red chests on the reels are replaced by purple chests and after the next spin they are transformed into matching symbols to help and form wins. If either the red or the purple chest lands partially stacked on the first or fifth reels then there is a chance that the reel will be nudged to fill it with the chest and trigger the feature. Queen of the Castle has a betting range of £0.40 up to £100 per spin. The game’s logo offers the top payout of 20x, the dog can payout up to 12x, the purse can payout up to 10x and the throne can payout up to 9x. The yellow and blue gems can payout up to 8x and the pink and green gems can payout up to 7x. If you want to see what it is like to rule from a beautiful castle then give this slot a spin today and you may soon be enjoying great rewards. Ra is probably the most famous of the Egyptian gods and he is a popular theme for online slots. 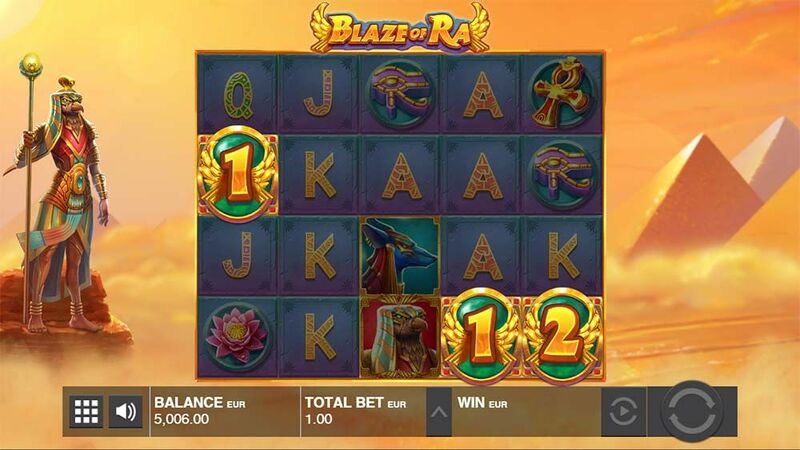 Now Push Gaming has brought Ra to the reels in an exciting new slot called Blaze of Ra and it could see you win some great treasures. 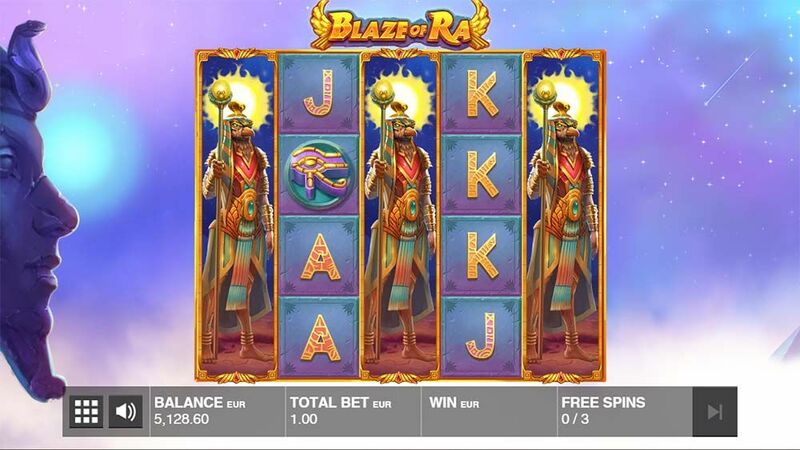 Blaze of Ra is a 5 reel slot with 4 rows and 40 fixed paylines. Behind the reels you can see Ra standing to the left hand side as sand billows across the screen with huge pyramids in the background. There are a number of theme related symbols including representations of two Egyptian gods, a cat and a dog, an ankh, Ra’s staff, the Eye of Ra and a flower. The lower value symbols are the playing cards J to A.
Ra is the wild symbol, he can substitute for all of the other symbols, except the scatter symbol, to help and form winning combinations. The scatter symbol is the golden scarab. The Ra wild symbol can land stacked on the reels and if one of the symbols lands on the top two rows of a reel the Nudging Wilds are triggered. The stack of wilds will be nudged down two positions for the next spin and hopefully form some wins. When at least three golden scarab scatter symbols land anywhere on the reels the free spins are triggered. Each symbol will reveal one or two spins so it is possible to win up to ten free spins. During the free spins each scarab that lands will award an extra spin. Best of all, to help you land numerous wins the first, third and fifth reel will be completely wild for the duration of the spins. Blaze of Ra has a betting range of £0.20 up to £100 per spins so it is entirely affordable to play. There is a top payout of 2000x for landing five wild symbols along a payline. The cat god can payout up to 800x, the dog god can payout up to 500x, the ankh can payout up to 400x, the staff can payout up to 300x, the Eye of Ra can payout up to 200x and the flower can payout up to 100x. If you want to experience the power of Ra and see if he is prepared to bestow great riches upon you then give this exciting new slot a spin today. Not all of us will be able to go climbing in the highest mountain range in the world, but thanks to the new Himalayas Roof of the World slot from Barcrest we are all able to get an idea of what it might be like. 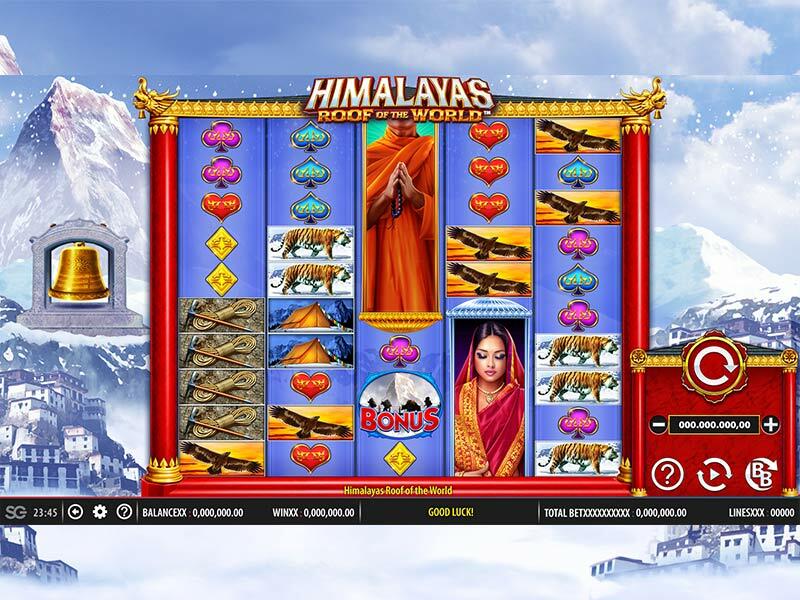 Himalayas Roof of the World is a 5 reel slot with 10 rows and 100 fixed paylines. The reels are set in an ornate frame with red pillars and gold decorations while in the background you can see the mountain range and a view of a palace. The highest value symbols are a monk and a woman and they can both appear stacked on the reels. The other symbols include an eagle, climbing equipment, a tiger and a tent. There is an icy ‘Wild’ symbol that can substitute for all the other symbols, except the bonus symbol, to help and form winning combinations. The bonus symbol is a mountain. At any point while playing the Snow Slide feature can begin. It is an avalanche that crashes over the reels and leaves up to fifty wild symbols behind it. If you land three, four or five of the mountain bonus symbols on the reels you will win 8, 12, or 20 free spins respectively. At the end of the spins you get to spin a wheel that can take you to a special bonus map of the Himalayas where you can win extra spins. Furthermore, you may also see the Big Freeze symbol during the free spins and this will expand to fill an entire reel with wild symbols. The slot also offers an optional Big Bet Game. You can pay £20, £30 or £50 for five special spins with bonus features. At £20 the free spins can be triggered with just two bonus symbols, at £30 the free spins can be triggered with two bonus symbols and the lower value symbols are removed, and at £50 the free spins can be triggered with two bonus symbols, the lower value symbols are removed and one reel is always completely wild. Himalayas Roof of the World has a betting range of £0.10 up to £500 per spin so it is suitable for all budgets. There is a top payout of 500x for landing five monk symbols while the woman can payout up to 400x. The tiger and eagle can both payout up to 200x and the tent and climbing equipment can payout up to 150x. If you feel like a climbing adventure then give this new slot a spin today and take your play to new heights.